This is a very special version of the Blue Marble: Earth captured on its entirety from an altitude of 512 miles (824 kilometers) over the North Pole. Humanity has never had an image so detailed of our home planet from this unique perspective. It's actually kind of weird, since we are so used to the familiar Western and Eastern hemispheres, taken from Earth's orbital plane. Here you can clearly see Britain, the whole of Europe, with Spain kissing Northern Africa, the entire Mediterranean Sea, the Red Sea, and almost all of Asia, plus Greenland and North America on the top. 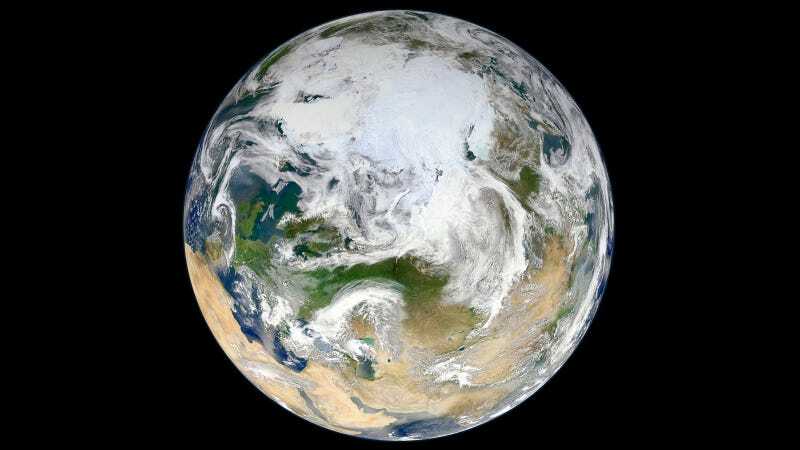 The Arctic view of the Blue Marble is not a single photo. Like the other Blue Marbles—except for the original, which was a photo taken by the Apollo 17 crew on December 7, 1972, at a distance of about 45,000 kilometres—it took 15 orbits to "gather the pixels for this synthesized view of Earth," according to NASA. Those pixels were captured by the Visible Infrared Imaging Radiometer Suite (VIIRS) on board the Suomi National Polar-orbiting Partnership satellite. The VIIRS is a 22-band radiometer designed to take photographs on infrared and visible light. It also takes "radiometric measurements of the land, atmosphere, cryosphere, and oceans" and it's capable of measuring "cloud and aerosol properties, ocean color, sea and land surface temperature, ice motion and temperature, fires, and Earth's albedo," our home planet's sunlight reflection coefficient.